Sir David Murray - River Tay, a watering place - Online gallery supplying original fine art. Trending Modern British and Contemporary Welsh. Available for sale from Big Sky Fine Art; this original oil painting by David Murray dating from around the late 1880s.<br> The painting is presented and supplied in an early 20th century frame.<br> The painting is signed lower left.<br> Previously with Barton & Long, 84 Whiteladies Road, Bristol.<br> <br> Sir David Murray was a popular and prolific Scottish landscape painter, both in oils and watercolour. He also painted some coastal and marine scenes, and sporting subjects including angling, shooting and cricket. He enjoyed huge public recognition and his works was fashionable for many years.<br> <br> He was born in Glasgow, Scotland, on 29th January 1849, the son of a shoemaker. He was educated in Glasgow, and then embarked on a business career, working for merchants in the city for eleven years. He also however spent his evenings studying at the Glasgow School of Art under Robert Greenlees and from about 1875 he devoted himself fully to his art.<br> <br> He became an Associate of the Royal Scottish Academy in 1881, and the following year moved to London in 1882 where he was an immediate success<br> <br> During his career he exhibited some 175 works. His “My love has gone a-sailing” was exhibited in 1884 and was purchased by the Chantrey Trustees for the Tate Gallery. He occasionally worked as an illustrator and his illustrations for ‘The English Illustrated Magazine in 1887 drew some acclaim.<br> <br> About 1886 he broadened his horizons and travelled to the continent; he worked in France and later in Italy for some time, but all his more characteristic work was done on Scotland or England. It is considered that his best work is that done of Scotland before the turn of the century, which is detailed and fresh.<br> <br> In 1891 Murray was elected an Associate of the Royal Academy and he became a full member in 1905. His work was very popular and his style was likened to Constable.<br> <br> Murray was a member of Glasgow Art Club and exhibited in the club’s annual exhibition. He became President of the Royal Institute of Painters in Water Colours in succession to Sit James Linton in 1917, and the following year he was knighted.<br> <br> Today his works are held in the art galleries of Aberdeen, Glasgow, Paisley, Manchester and Sydney, as well as the Edinburgh City Collection.<br> <br> Murray did not marry and during the whole of time in London he occupied the same bachelor’s quarters, namely the studio of Millais in Langham Chambers, Portland Place<br> <br> A portrait of Sir David Murray by the Scottish painter James Coutts Michie is held by the Aberdeen Art Gallery.<br> <br> Sir David died in Marylebone, London on 14th November 1933. 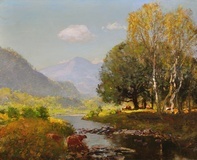 At his death, he left a bequest to the Royal Academy to encourage landscape painters.<br> <br> This original oil on canvas depicts a very classical scene, with three cattle drinking from a wide, open river, green banks and shrubs in the foreground, and ranges of pastel coloured mountains in the background. In the middle-ground are a number of tall native trees, beneath which we glimpse other cattle grazing. The bright light greens and yellows suggest that it is perhaps spring or early summer. The overall mood is calm and fresh.<br> <br> The River Tay is the longest river in Scotland, originating in western Scotland on the slopes of Ben Lui, flowing easterly across the Highlands, through Loch Dochar, Loch Lubhair and Loch Tay, then through Strathtay, then through Perth, where it becomes tidal, and on to its mouth at the Firth of Tay, south of Dundee. 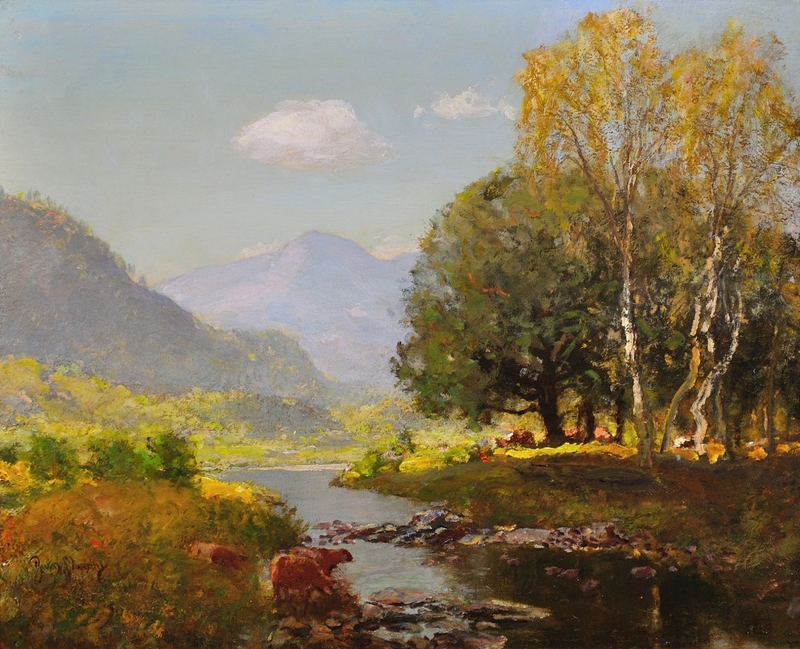 Available for sale from Big Sky Fine Art; this original oil painting by David Murray dating from around the late 1880s. The painting is presented and supplied in an early 20th century frame. The painting is signed lower left. Previously with Barton & Long, 84 Whiteladies Road, Bristol. Sir David Murray was a popular and prolific Scottish landscape painter, both in oils and watercolour. He also painted some coastal and marine scenes, and sporting subjects including angling, shooting and cricket. He enjoyed huge public recognition and his works was fashionable for many years. He was born in Glasgow, Scotland, on 29th January 1849, the son of a shoemaker. He was educated in Glasgow, and then embarked on a business career, working for merchants in the city for eleven years. He also however spent his evenings studying at the Glasgow School of Art under Robert Greenlees and from about 1875 he devoted himself fully to his art. During his career he exhibited some 175 works. His “My love has gone a-sailing” was exhibited in 1884 and was purchased by the Chantrey Trustees for the Tate Gallery. He occasionally worked as an illustrator and his illustrations for ‘The English Illustrated Magazine in 1887 drew some acclaim. About 1886 he broadened his horizons and travelled to the continent; he worked in France and later in Italy for some time, but all his more characteristic work was done on Scotland or England. It is considered that his best work is that done of Scotland before the turn of the century, which is detailed and fresh. In 1891 Murray was elected an Associate of the Royal Academy and he became a full member in 1905. His work was very popular and his style was likened to Constable. Murray was a member of Glasgow Art Club and exhibited in the club’s annual exhibition. He became President of the Royal Institute of Painters in Water Colours in succession to Sit James Linton in 1917, and the following year he was knighted. Today his works are held in the art galleries of Aberdeen, Glasgow, Paisley, Manchester and Sydney, as well as the Edinburgh City Collection. A portrait of Sir David Murray by the Scottish painter James Coutts Michie is held by the Aberdeen Art Gallery. Sir David died in Marylebone, London on 14th November 1933. At his death, he left a bequest to the Royal Academy to encourage landscape painters. This original oil on canvas depicts a very classical scene, with three cattle drinking from a wide, open river, green banks and shrubs in the foreground, and ranges of pastel coloured mountains in the background. In the middle-ground are a number of tall native trees, beneath which we glimpse other cattle grazing. The bright light greens and yellows suggest that it is perhaps spring or early summer. The overall mood is calm and fresh. The River Tay is the longest river in Scotland, originating in western Scotland on the slopes of Ben Lui, flowing easterly across the Highlands, through Loch Dochar, Loch Lubhair and Loch Tay, then through Strathtay, then through Perth, where it becomes tidal, and on to its mouth at the Firth of Tay, south of Dundee.